There are magical places which you can cruise into on well paved roads, their natural attractions are described by multilingual information tables while your travel needs are taken care of by an army of tourist professionals. And then there are those that have been - by design - left as they were. No trails, no signs, no hot dog stands, no souvenir shops. Just you against the wilderness. Mano a mano. Arizona Wave is one of those places. But have some serious patience ready. 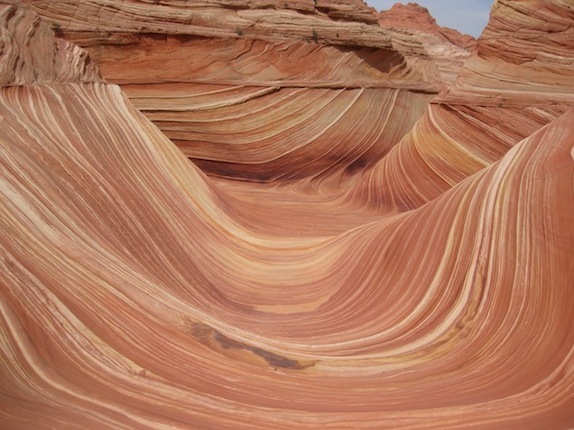 This breathtaking rock formation in the North Coyote Buttes area is pretty darn difficult to get into. Since the Bureau of Land Management which operates the stratified wonder wants to preserve it in the most pristine form, only 20 hikers are let into the area every day. In practical terms that means you first have to win a daily access lottery which is held in Kanab, UT, every morning. Due to the spreading reputation of the place, the chances of winning are roughly 1 in 10. But even if you lose, you'll have a good time. The drawing presided over by the head ranger is titillating and entertaining at the same time. If you do win, though, you can expect a short (35 miles) drive on US 89 towards Page, AZ and then about 8 more miles on a local dirt road (not always accessible to standard passenger cars). This road is so dusty that I saw avalanches of fine orange dust sliding down our rear window as we were traversing the hallowed desert. But the effort is well worth it. The Wave is all it is cracked up to be and then some. It is beyond description both in terms of colors and in terms of shapes. The word that comes to mind most often is "otherworldly". Its undulating grace and petrified splendor will instantaneously enchant you. This is the Mecca of landscape photographers many of whom have tried to capture its majestic charm for decades. Most of them failed in sweet agony. And when you finally find that mystical angle which renders its curvy walls in the most pleasing manner, you can start exploring the surrounding gorges, ledges, rock faces and omnipresent buttes. On the one hand I wish I could have spent more time there, but on the other hand the limited time makes the experience even more unique. Like a surreal dream hanging in the marble aisle of your memory.